Good Quality saddlebag with some extra length. Studded trim allows a little extra touch of class! Cut outs on throwover center. 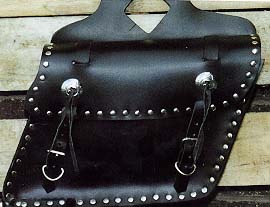 This large throw over black motorcycle bag feature studs and silver tone conchos.